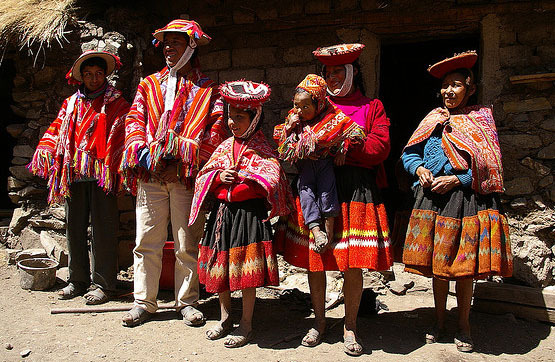 One of the great challenges to knowing the true history of the Incas is the lack of writing of the Quechua people. This is why one sees many spellings for the same words, most notably the interchangeability between C and Q and K. For example, one can see Cusco spelled as Qosqo or the Inca site of Qoriqancha as Coricancha or Koricancha. The Quechuas did have a mode of communication other than oral, however, and this was the use of khipu. Khipu means knot or knots and the khipu used for communication were cords containing one or more knots. They are believed to have been used at least for keeping numerical records which could be sent from one place to another in the Incan empire through use of runners. The lack of written records has puzzled archaeologists for years, as it is highly unusual for such an advanced civilization as the Inca to be without a form of writing. It was at first unclear exactly what role the khipu played, although an early historian, Garcilaso de la Vega, writing in the 16th century stated that they were kept in every village for purposes of record keeping. The khipu are extraordinarily complex. The knots can be different lengths and sizes, the direction the string is twisted in can differ, and the color and the type of fiber used can vary as well. They were so complicated that the Spanish religious leaders believed they must be tools of the devil and burnt great numbers of them. Secular leaders destroyed them as well, fearing that those making the khipus were not loyal to the Spanish and could be spreading misinformation. It was not until researchers at Harvard University, Gary Urton and Carrie Brezine, first started working on cracking the code of these knots in 2002, that light began to be shed on Incan records that could not be read previously. They used a computer database in order to cross-reference the many variations and thus begin to understand their significance. What they have found thus far, however, are believed to be numerical in nature. It’s still unclear whether the khipu may have been used to communicate more than numbers. As there are only 600 or so known surviving khipu to date, the amount of information that can be cross-referenced is limited. However, one of the largest surviving collections was not discovered until 1956. When one considers that Peru is full of remote villages, it seems likely that more of these records may be found in the future, helping to solve this knotty problem. Both Lima and Cusco are home to several excellent museums on Inca history, with rich collections of artifacts. Arrange a tour through any reputable travel agency, such as this specialist in Machu Picchu packages and South America tours.